In this lesson, we will learn how to solve problems on moving a particle on a rough horizontal plane by resolving the forces parallel and perpendicular to the plane. A body weighing 𝑊 is moving at a constant speed on a horizontal plane under the action of a force 145 N whose line of action is inclined at an angle 𝜃 to the horizontal, where s i n 𝜃 = 3 5 . If the resistance of the plane to the body’s motion is 1 6 𝑊 , find 𝑊 and the normal reaction of the plane 𝑅 . A body of mass 271 grams is placed on a rough horizontal plane. The coefficient of kinetic friction between the body and the plane is √ 3 7 . A force of magnitude 271 grams-weight is applied to the body acting upwards at an angle of 3 0 ∘ above the horizontal causing it to move with uniform acceleration as shown in the figure. After 5 seconds of motion, the force is removed. Determine 𝑣 , the velocity of the body at the end of these 5 seconds and find the time 𝑡 it takes for the body to come to rest after the force has been removed. Take 𝑔 = 9 . 8 / m s 2 and give your answers correct to two decimal places. A body of mass 19.5 kg was placed on a horizontal rough plane. The coefficient of static friction between the body and the plane was 0.4 and that of kinetic friction was 0.2. A horizontal increasing force acted on the body till it moved. Determine the friction force 𝐹 1 between the body and the plane when the body was about to move, and find the friction force 𝐹 2 between the body and the plane during the body’s motion. Take 𝑔 = 9 . 8 / m s 2 . A horse was pulling a wooden block along a section of horizontal ground. The pulling force of the horse was 22 kg-wt which was acting on the block at an angle of 6 0 ∘ to the vertical. Given that the block was moving uniformly, determine the magnitude of the friction acting on the block. Using the information in the figure, calculate the coefficient of kinetic friction rounding the result to the nearest two decimal places given that the mass of the body is 28 kg and that the acceleration due to gravity 𝑔 = 9 . 8 / m s 2 . A body of mass 21 kg was placed on a rough horizontal plane. A horizontal force of magnitude 144.06 N acted on the body, causing a uniform acceleration of 4.9 m/s2. Determine the coefficient of friction of the plane. Take 𝑔 = 9 . 8 / m s 2 . A body of mass 440 g was resting on a rough horizontal plane whose coefficient of friction was 1 4 . The body was dragged across the plane by the action of a horizontal force. Given that the action of this force resulted in a uniform acceleration of 170 cm/s2, find the magnitude of the force. Take the acceleration due to gravity 𝑔 = 9 . 8 / m s  . A horizontal force of magnitude 57 kg-wt started acting on a body which had been at rest on a rough horizontal ground. The force acted on it for 2 seconds and caused it to move a distance of 13.3 m. After the force stopped acting, the body covered another 13.3 m before it came to rest. Taking 𝑔 = 9 . 8 / m s 2 , determine the mass of the body 𝑚 and the resistance of the ground to its motion 𝑅 . A body of mass 5 kg was placed on a rough horizontal plane, where the coefficient of friction between them was √ 3 2 . A force of 4 √ 3 kg-wt, whose line of action made an angle of 6 0 ∘ with the horizontal, acted on the body for 5 seconds. Find the time taken for the body to come to rest after the force stopped acting. Take 𝑔 = 9 . 8 / m s 2 . A body of 12 kg was placed on a rough horizontal plane. It was pulled by a force whose line of action made an angle of 𝜃 upwards of the plane where s i n 𝜃 = 3 5 . If the body, starting from rest, moved a distance of 804 cm in 4 seconds and the coefficient of friction was 3 4 , find the magnitude of the pulling force. Take the acceleration due to gravity 𝑔 = 9 . 8 / m s 2 . A body of mass 1 1 √ 3 kg is placed on a rough horizontal plane. The coefficient of static friction between the body and the plane is √ 3 3 and the coefficient of kinetic friction is √ 3 7 . A force is acting on the body where its line of action makes an angle of 6 0 ∘ to the horizontal. The force causes the body to be on the point of moving. If the magnitude of the force is increased from 𝐹 1 to 𝐹 2 , the body would start moving and accelerate at 5 √ 3 3 m/s2. Find 𝐹 1 and 𝐹 2 . Take 𝑔 = 9 . 8 / m s 2 . A body of mass 905 kg was flying at 864 km/h when it entered a dust cloud. The dust cloud produced a friction force of 1 2 kg-wt for each kilogram of the body’s mass. Given that the body flew through the dust cloud for 30 seconds, find its speed when it left the cloud. Take 𝑔 to be 9.8 m/s2. A body of mass 1 kg was placed on a rough horizontal plane, where the coefficient of friction between them was √ 3 3 . 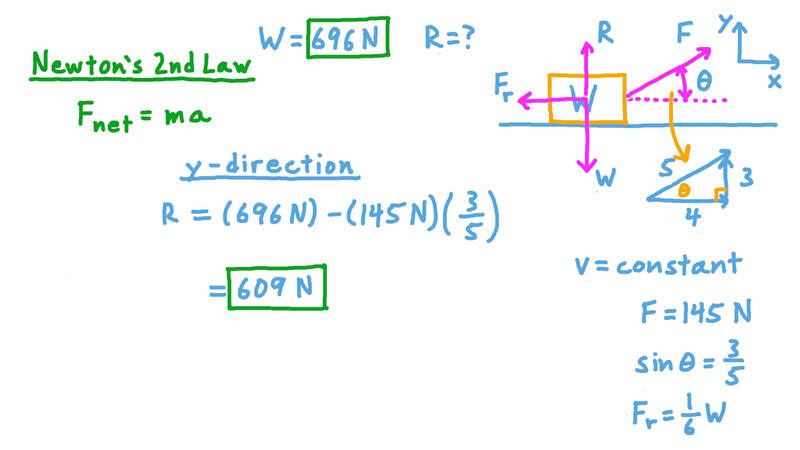 A force of √ 3 kg-wt, whose line of action made an angle of 6 0 ∘ with the horizontal, acted on the body for 6 seconds. Find the time taken for the body to come to rest after the force stopped acting. Take 𝑔 = 9 . 8 / m s 2 . A body of mass 280 g was resting on a rough horizontal plane whose coefficient of friction was 4 5 . The body was dragged across the plane by the action of a horizontal force. Given that the action of this force resulted in a uniform acceleration of 170 cm/s2, find the magnitude of the force. Take the acceleration due to gravity 𝑔 = 9 . 8 / m s  . A horizontal force of magnitude 45 kg-wt started acting on a body which had been at rest on a rough horizontal ground. The force acted on it for 2 seconds and caused it to move a distance of 14.7 m. After the force stopped acting, the body covered another 7.35 m before it came to rest. Taking 𝑔 = 9 . 8 / m s 2 , determine the mass of the body 𝑚 and the resistance of the ground to its motion 𝑅 . A body of mass 215 grams is placed on a rough horizontal plane. The coefficient of kinetic friction between the body and the plane is √ 3 4 2 . A force of magnitude 250 grams-weight is applied to the body acting upwards at an angle of 3 0 ∘ above the horizontal causing it to move with uniform acceleration as shown in the figure. After 5 seconds of motion, the force is removed. Determine 𝑣 , the velocity of the body at the end of these 5 seconds and find the time 𝑡 it takes for the body to come to rest after the force has been removed. Take 𝑔 = 9 . 8 / m s 2 and give your answers correct to two decimal places. A body of mass 23.1 kg was placed on a rough horizontal plane. A horizontal force of magnitude 97.02 N acted on the body, causing a uniform acceleration of 2.8 m/s2. Determine the coefficient of friction of the plane. Take 𝑔 = 9 . 8 / m s 2 . A body of mass 12 kg is placed on a rough horizontal plane. The coefficient of static friction between the body and the plane is √ 3 3 and the coefficient of kinetic friction is √ 3 7 . A force is acting on the body where its line of action makes an angle of 3 0 ∘ to the horizontal. The force causes the body to be on the point of moving. If the magnitude of the force is increased from 𝐹 1 to 𝐹 2 , the body would start moving and accelerate at √ 3 3 m/s2. Find 𝐹 1 and 𝐹 2 . Take 𝑔 = 9 . 8 / m s 2 . Using the information in the figure, calculate the coefficient of kinetic friction rounding the result to the nearest two decimal places given that the mass of the body is 36 kg and that the acceleration due to gravity 𝑔 = 9 . 8 / m s 2 .